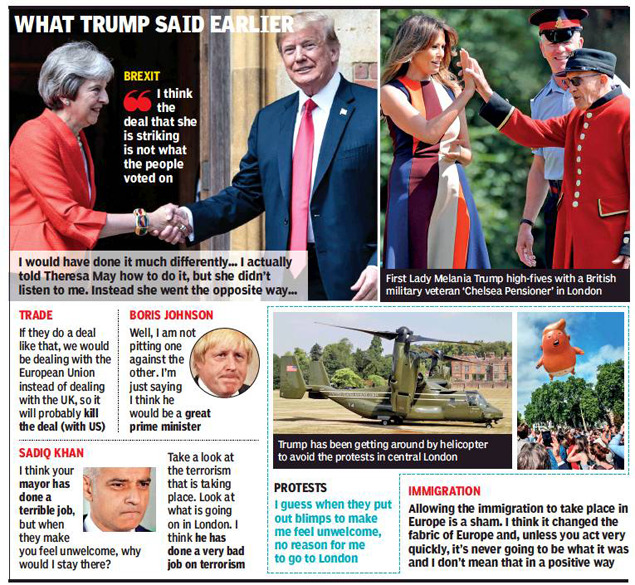 Trump’s visit to the UK has been overshadowed by massive protests and an explosive interview in The Sun in which he blasted May, blamed London’s mayor for terror attacks against the city and argued that Europe was “losing its culture” because of immigration. ELLESBOROUGH (ENGLAND): President Donald Trump pulled off a diplomatic backflip on Friday, reversing himself on trade, Brexit and his critical assessment of British PM Theresa May while insisting the US-UK relationship is “the highest level of special”. Just days after lobbing thunderous broadsides at his British hosts, Trump was on his best behaviour as he capped his two-day visit to the UK by dropping by Windsor Castle for tea with the Queen. Trump’s visit to the UK has been overshadowed by massive protests and an explosive interview in The Sun in which he blasted May, blamed London’s mayor for terror attacks against the city and argued that Europe was “losing its culture” because of immigration. Trump, who prides himself on not saying he’s sorry, did his own version of backtracking at a news conference with May, whom he lavished with praise on the heels of questioning her leadership. “I didn’t criticise the PM. I have a lot of respect for the PM,” Trump said. He blamed the newspaper for skipping over his praise of May in a piece that was published Thursday just as the PM played host to Trump at a country palace. He then urged reporters to listen to a full recording of the interview, which he said would give the full picture. But the audio was already posted on The Sun’s website and undermined Trump’s contention it would back him up. The interview comes at a perilous time for May, whose government is teetering amid contentious negotiations on how the UK will leave the EU. Interviewed before he left Brussels for the UK, Trump had accused May of ruining what her country stands to gain from its Brexit vote. Trump said that May’s “soft” blueprint for the UK’s future dealings with the EU would probably “kill” any future trade deals with the US. “If they do a deal like that, we would be dealing with the European Union instead of dealing with the UK, so it will probably kill the deal,” Trump had said. 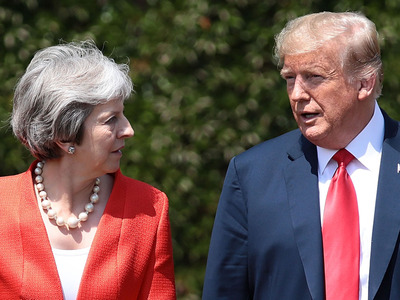 Trump also said, “The deal she is striking is a much different deal than the one the people voted on.” He also told the tabloid that he’d shared advice with May during Britain’s negotiations with the EU and she ignored it. Tens of thousands of people gathered in London for a series of demonstrations against his visit. Marchers gathered near BBC headquarters in London before walking to the Parliament. Published on Sat, 14 Jul 2018 01:24:35 GMT, © All rights reserved by the publisher.